He should've included the famouse "People die if they get killed" line. Maybe "People fail if they get an F" or something like that. Honestly, he's absolutely right. Literature classes have grown to be so pathetic. They're supposed to let you give out your own creative interpretation of things, but instead the teachers decide to tell you what they think instead. I am the bone of my sword. Steel is my body, and fire is my blood. I have created over a thousand blades. Unknown to death. Nor known to life. Have withstood pain to create many weapons. Yet, those hands will never hold anything. So as I pray, "Unlimited Blade Works." The good news: he didn't get an 'F' on the essay. The bad news: he got an 'F' as an overall. He clearly meant bone, not bane. the F was his overall grade, not the single grade for that peice of work. What kind of teacher puts a sad face as a remark? Unlimited essay works - what does that mean? I liked it! It did what it said on the tin as far as I'm concerned. Teacher is just sore that the person put down his/her class. 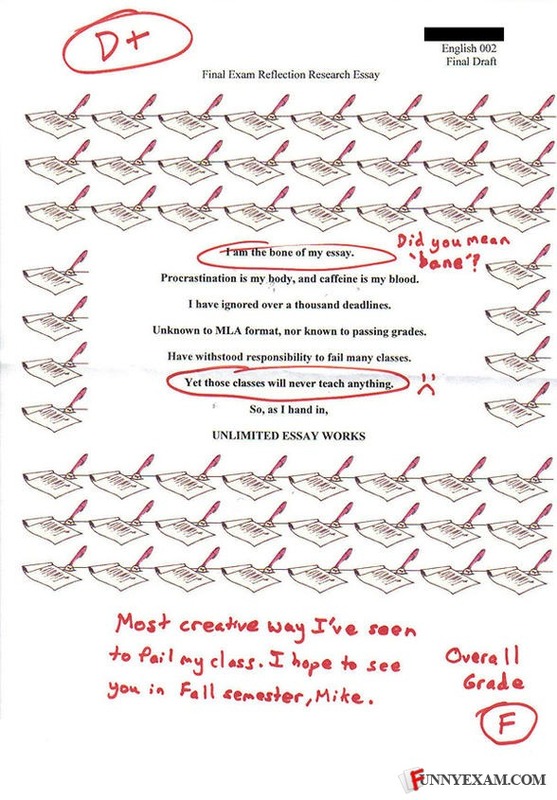 It's the most creative way to pass the class, you just need to read between the lines! "Yet those classes teach me nothing" I don't think the teacher should be allowed to take points off for that. The teacher didn't think he meant bane, he/she was making a joke. Too bad he couldn't keep it up to pass. Must have run out of mana. Honestly, I feel bad for the teacher. Technically, a D+ is a passing grade because. it's below a D- that you fail a d+ is below average but it's not a failing grade. lol I never expected to see this here. Creative? I read it twice, and still can't figure out what he meant. The only reason you have never received a letter like that, is because it was clearly made on MS paint. teacher writes a better impromptu - probably lots of practice. HE GOT A D+ FOR THIS?!!?!! lol...bone someone likes to bone his essays!! why is there a D+ AND an F on it???? This teacher fails. Horribly. He/She should go jump off a building. As Archer comes up from behind and kills him. With infinite swords. Please. Funnier rendition. "I am the bone of my pants. Steel is my wang, and fire is my blood. I have banged over a thousand ladies. Unknown to STD. Nor known to childbirth. Girls withstand pain to sleep many nights with me. Yet these hands will never fap to anything. So as I pray, UNLIMITED WANG WORKS"
>In my 4 years of high school, I NEVER received a letter grade like this; it was always a number. And I doubt this is a college paper (or even real for that matter)< My school had number grades, but it was changed to letters. Something about being a military community, and that most other military communities' schools used letter grades and they wanted to keep it the same. So basically you're dumb. What did little Sally say to the clown after the party?